At a recent tree identification workshop I brought some samples of hedge maple (Acer campestre) and when the learners were keying these out I noted to them that stems had “wings”. Several attendees were more quizzical than usual at my ramblings and asked what I meant. “Wings” or raised or corky projections on stems of woody plants are perhaps most common with regard to winged euonymus (Euonymus alatus) from the Latin alatus which means “having wings or winglike extensions”. There are many additional woody plant species that have “wings”, though, including sweetgum, burr oak, hedge maple, and winged sumac, though some of these, such as hedge maple and sweetgum vary widely in whether or not wings are present or prominent on any individual plant. 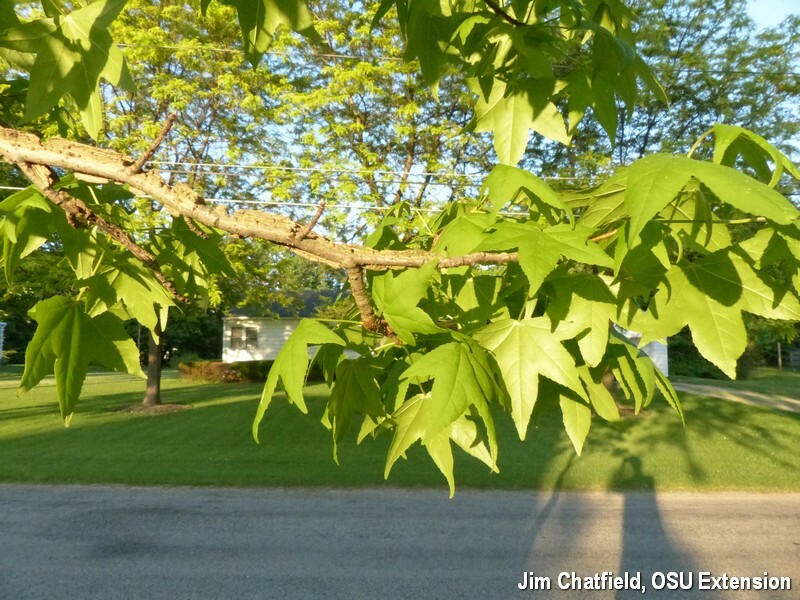 My unawareness that hedge maples sometimes have prominent wings once presented a diagnostic conundrum as I led a walk on a northeast Ohio city street. There were some hedge maple street trees not doing well in terms of branch dieback and small leaves (I later suspected salt damage), but there were symptoms suggesting growth-regulator herbicide injury on the hedge maple leaves and on weeds below. I half-convinced myself that the wings, which I had not previously noticed on hedge maple, were the result of herbicide damage. Actually, just needed a prescription of Question #2 of the 20 Questions of Plant Problem Diagnostics: What is normal for the plant?